Plastic Water Bottles: How Safe Are They? The bottled water industry has enjoyed booming growth in the recent decade as an increasingly health conscious population sought the convenience and perceived “purity” in purchasing bottled water. Aside from questions about the source of many bottled “spring” water brands, (some of which simply come from filtered tap water), fewer required tests for contaminants as compared to municipal sources, and the greater expenses and environmental impact of increased plastic waste, another important question has surfaced in recent years: how safe are these plastic containers for our health? In addition, many plastics include a chemical called, Di(2-ethylhexyl)phthalate (DEHP), which helps to keep them flexible. It is present in plastic bottles, as well as many food storage plastics and plastic wraps. This chemical has been shown to be harmful to reproductive organs in rat models when consumed in high levels, as well as damaging to fetal development.5 The effect of long term, low level exposure to these chemicals is unknown. What about those clear, hard plastic bottles? The plastic used in making many types of hard plastic bottles, most baby bottles, liners within food and beverage cans, as well as the large sized water cooler jugs in many offices, is called polycarbonate. In recent years it has been found that this type of plastic leaches small amounts of bisphenol A (BPA), which is a neurotoxic, estrogen-like chemical that can disrupt natural hormone functions in animal studies.6 When used at normal temperatures, leached amounts of BPA fall far below what is deemed toxic for human exposure. However, it has been found that when these plastics are exposed to hot water, through washing or storing hot liquids and foods, they can leach up to 55 times as much of this chemical! Because these plastics are everywhere in our environment, and studies have not been able to control for the compounded effects of low dose, chronic exposure to these substances over many years, it seems wise to reduce exposure as much as possible. Especially at a time when environmental contaminants which mimic estrogens could be contributing to our increasing incidences of cancers in reproductive organs, lowered sperm counts in men, and overall increase in endocrine disorders. So how can you limit the exposure of potentially dangerous plastics to your family? It is best to use glass or stainless steel bottles instead of plastic. When you do use plastic bottles, never store in hot temperatures or sunlight (don’t leave them in the care! 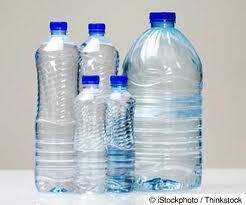 ), and don’t reuse- dispose the bottle into the correct recycling bin after a single use. With food storage, try to avoid purchasing items covered in plastic wraps or plastic containers. Hot temperatures and fatty foods in direct contact with the plastic will cause higher migration of contaminants. Some brands, like, “Saran Wrap” and “Glad Wrap” have changed their product so that they no longer contains BPA. Never put a plastic container into the microwave unless specifically designated as microwave safe. Taking these guidelines for use into consideration, the plastics least likely to leach when used as recommended, are numbered: #1, 2, 4 and 5. 2. De Fusco R, et al. “Leaching of mutagens into mineral water from polyethyleneterephthalate bottles.” Sci Total Environ. 1990 Jan;90:241-8. 6. Le, H., et al. “Bisphenol A is released from polycarbonate drinking bottles and mimics the neurotoxic actions of estrogen in developing cerebellar neurons.” Toxicology Letters. 2008 Jan 30;176(2):149-56. This is a very informative post and I love your topic!! Very important!! Nice info!! !